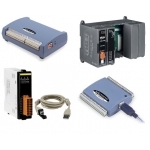 We have a variety of USB Based Data Acquisition units available, single box or modular systems, low or high speed with various ADC resolutions. These systems have fairly comprehensive software support either via User Libraries to write custom drivers, their own basic software up to more advanced packages such as our Orchestrator SCADA software, Dasylab, Labview or Matlab. USB-based DAQ device with 16 analog inputs, 500 kS/s sample rate, two analog outputs, two 32-bit counter inputs, one timer output, and 8 digital I/O; compatible with 8B analog modules and SSR digital modules. Includes an external power supply and accessory kit. USB-based DAQ device with 16 analog inputs, 500 kS/s sample rate, two 32-bit counter inputs, one timer output, and 8 digital I/O; compatible with 8B analog modules and SSR digital modules. Includes an external power supply and accessory kit. USB-based multifunction data acquisition device with 8 SE simultaneous analog inputs, 16-bit resolution, 400 kS/s sampling, and 8 digital I/O. USB-based 16-channel, 250 kS/s data acquisition device with eight digital I/O, two 32-bit counter inputs, and one timer output. Data Acquisition / ADC card for InstruNet 400 systems, providing 8 Differential or 16 Single-ended Analogue Inputs, 4 Analogue Output channels and 4 Universal Digital I/O channels. Amplifier Card for InstruNet 400 systems, which provides 6off independently configurable differential Analog Input Channels and 4off Universal Digital I/O channels. This card is generally used when low level signals are to be monitored or if the cable between the Host computer and the InstruNet-400 card cage is relatively long. Plug-in multiplexer card for InstruNet-400 system which provides additional Analogue Input Channels (10 differential or 20 Single-ended) plus 4 Universal Digital I/O channels. Plug-in Digital I/O card for the InstruNet-400 provides 12off Universal Digital I/O with 20mA Sink plus 16 off Digital I/O channels with 200mA Sink capability. Wiring Box to attach to any InstruNet-400 series Card with an HD44 connector, providing simple screw terminal connections for your sensors. Rugged Card Cage for InstruNet-400 systems, each of which can support 4off plug-in cards. Multiple iNet-400 Card Cages can be bolted together to form 8, 12 or 16 slot backplanes. The iNet-512 Connection box has an individual connector for up to 8 Differential Analog Input channel, providing energisation connections for each channel. The InstruNet-410 Card provides an interface between the Host Computer, via an InstruNet Controller card to the InstruNet-400 Card Cage with its Data Acquisition cards. An advanced version of the standard InstruNet World package offering additional features. InstruNet 500 Anti-Aliasing filter for use with the iNet-423 Analog Card. Available in 4 versions and supplied in a pack of 2 filters (2 channels). The USB-87P1 Intelligent I/O Expansion Unit has a single slot to take Plug-in units from the I-87K range of serial I/O devices and connects to a host computer or other devices via USB. It features the ability to "Hot-swap" the I/O modules. The USB-87P2 Intelligent I/O Expansion Unit has 2 slots to take Plug-in units from the I-87K range of serial I/O devices and connects to a host computer or other devices via USB. It features the ability to "Hot-Swap" the I/O modules. The USB-87P4 Intelligent I/O Expansion Unit has 4 slots to take Plug-in units from the I-87K range of serial I/O devices and connects to a host computer or other devices via USB. It features the ability to "Hot-Swap" the I/O modules. USB Data Acquisition Unit for 8Diff/16se channels, with 4 DIO. 24-bit, up to 16ks/s. Isolated USB Data Acquisition Unit for 8Diff/16se channels, with 4 DIO. 24-bit, up to 16ks/s. 8-channel Digital Temperature (-55 to +125'C) Data Acquisition unit, supplied with 4 probes. Also has 8 Digital Logic Status Inputs. Includes software and 4 temperature probes.